Helloooooo! 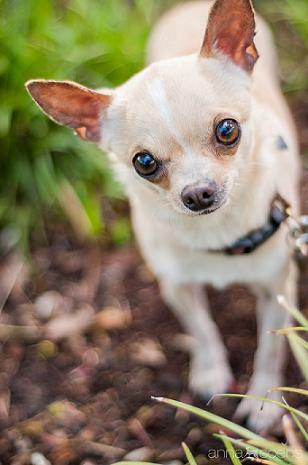 I’m Violet a 6 year old teensy weensy Chihuahua with a BIG heart. Weighing in at 4 lbs I can very comfortably sit at the top of the couch and snuggle against your neck as we watch romantic comedies. I have nothing in my heart but adoration for the people I love, but don’t worry I am a mighty protector too! I promise not to let any burglers even close to the family heirlooms because I am tiny but I am tough. I am also super intelligent, see how domed shaped my head is? That is to hold all smarts in, so don’t worry, if you forgot all of your trigonometry or need helping remembering the famous battle of Thermopylae, don’t worry I gotcha covered. So what, are you ready for a little girl with a big personality? Then fill out an application at pixieproject.org and send it in so we can schedule a meet and greet! I am fixed, vaccinated and microchipped. My adoption fee is $180. I am currently living in foster care.